There are people alive who grew up wearing only cotton, wool, and other natural fibers. Think about it: for literally thousands upon thousands of years humans clad themselves in natural fibers that were TOTALLY compatible with the human metabolism. The natural fibers provided protection, warmth, and comfort with absolutely no risk. Enter the wonders of the chemical industry and petroleum products and we have now covered ourselves with clothing products that are quite literally poisoning our children. Some of the chemical innovations were designed to make the clothes 'fire retardant', which is a good thing. But what chemicals went into these products? Quite simply, what was wrong with wearing what our forefathers wore for generations? This page will provide links to companies producing natural and organic certified products. 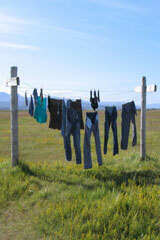 Organic_Clothing: "Certified Organic Clothing" What Does It Mean?